This PDF essay by Nicholas Wolfinger covers the practical details of note-taking for ethnographers in the field. Using Boolean Operators when searching will give you better, and more accurate, results. AND- Retrieves articles that contain all of the search terms and narrows down the results. OR- Retrieves articles with any of the terms and broadens the search. NOT- Eliminates articles containing the second term which narrows the search. Using Quotations or brackets will search for a phrase as a whole. 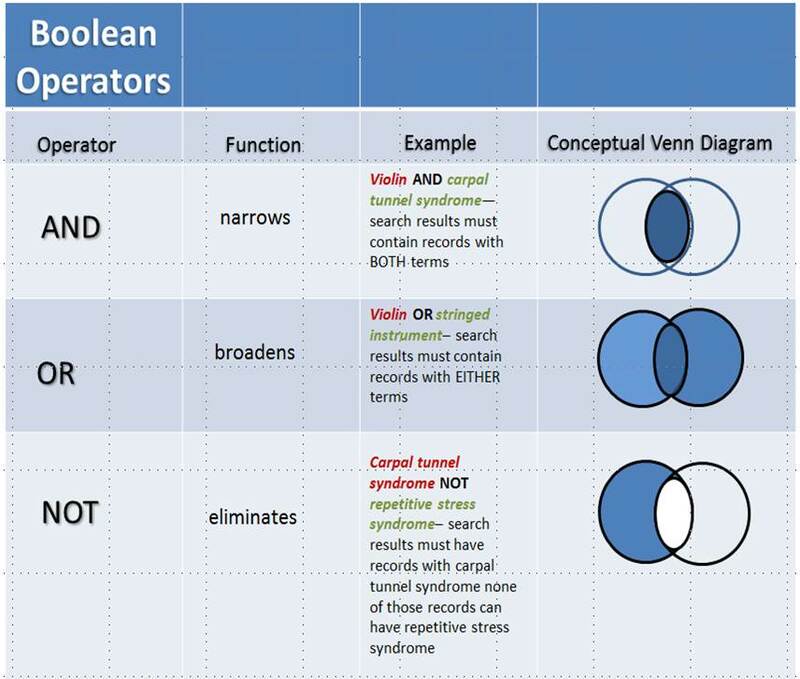 Using Boolean logic and keywords are essential when searching library databases. If you only search Google, you won’t get very far. Google uses natural language, which is great when you want to find certain everyday things on the open web, but natural language doesn’t work in databases. Citation searching, or using the references cited by authors, not only leads researchers to other relevant articles on their subject of interest, it can also indicate the importance of a piece of research. This is where you will want to use the library's "discovery tool", or the main search box on the library homepage. This feature is best used for a known item, such as an article that you know the title and author, or a book or ISBN number. Use subject terms Ethnography, Ethnology, Social Life and Customs. (Note: Most books in the library will not have a subject heading for Ethnography since it is not defined as a Library of Congress controlled term). Use keyword Ethnograph* to catch all variations of the word Ethnography, Ethnographic, Ethnographies. Not all books or articles label themselves as ethnographies. Read the abstract and summaries to determine if it fits the definition of an ethnography. 1. Filter out non-scholarly articles. If you are required to find peer-reviewed articles, look for the "Peer-Reviewed" box located in most databases to quickly weed-out most non-scholarly works. This will also remove newspapers, dissertations, blogs, and governmental or business reports. 2. Select "Full-Text" whenever you can. This will narrow results automatically to articles you can read right away, avoiding unnecessary delays for Interlibrary Loan. 3. Limit your results by most recent articles only. Most databases have either a limit or sort feature, enabling you to push more recent--and therefore more authoritative--results to the top. 4. Narrow your topic by adding more keywords for a particular time, place, demographic, or perspective. If your topic is "Farmer's Markets", you may try to include other keywords like Rural, Southwest, Economic Aspects, Women. 1. Cast a broader net with your search terms. Choose more general terms, remove specific locations. 2. Use a thesaurus to find synonyms for keywords. 3. Try different databases. We have a variety of resources--be diverse in your searching. 4. Contact your librarian. We are happy to help you explore alternative search strategies and locations to help you find resources. Most databases allow you to narrow your search results according to certain criteria. Limiters vary by database. Please check the database's Help page, for specific information.